We’re starting a new project this year called “Accessible Bath”: mapping accessible spaces around the area. Last week we held our first meeting to start shaping up the project and our initial plan of action. In this post I introduce the project, what we’ve learned so far, and what we’ve decided to do over the coming months. Over the last 12 months, as we’ve been out and about talking to local community groups, the issue of mapping accessible spaces and routes around Bath has cropped up several times. Creating maps is something that we’re always happy to help with, so we were keen to further explore what information would be useful to collect and the type of support needed. After meeting with Phillipa Gordon from the Bath Community Stroke Service, we decided to run a meetup to help us understand the issues better. We also did some research to explore the range of tools available to support this type of project. We held the fist meeting last week, bringing together members of Bath: Hacked with people from the local community who had suffered from strokes. They were able to provide us with first hand experience of the difficulties faced moving around the city, and useful insight into where better information would be useful. Collectively these challenges put a lot of pressure on people trying to get around the city. Improvements were highlighted in some areas, e.g. around Southgate. The limitations of Bath as a heritage site were recognised and understood, but there was also general agreement that better information could benefit both residents and visitors. We talked about a number of ways in which data could be collected and shared using mobile phones and online services. As well as additional data the council may be able to share. During the meeting I gave a short talk and demonstration of Wheelmap, a free and open service to support collecting information on accessible spaces. The service exists as both a website and as mobile applications, meaning that anyone can add to the map whether they are at home or on the go. It also provides a point of reference for people visiting the city looking for accessibility information. As the service is built on OpenStreetMap all of the information added to the map can be extracted and reused for other purposes. 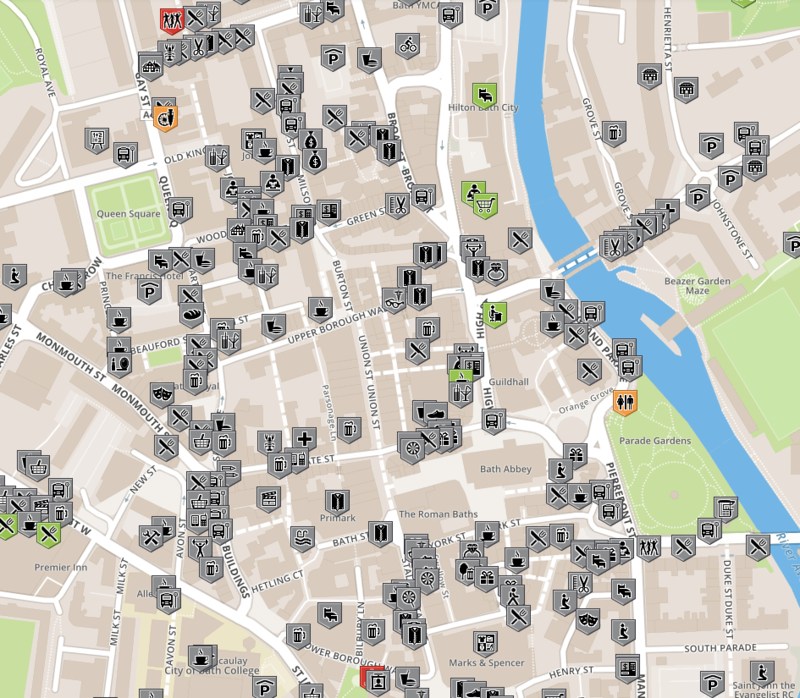 Looking at the map of Bath we can see that very few locations have accessibility information. This provides a good opportunity for us to run a crowd-sourcing exercise: how much information about the city can we gather over the next few months? We discussed what that kind of project might involve and the support required. For example, having a clear target to work towards would help focus contributions. There’s also a need to create guidance and training to help people use the service and ensure that information is being added consistently. Tom Fletcher has created a demo to show how we can track progress. I’m happy to see that the figures have already started to improve! Stay tuned for progress updates here, on twitter and facebook. Do let us know if you’re interested in helping out. For this to be successful we’re going to need the support of a team of volunteers. This is a great opportunity for everyone to contribute to improving lives around the city. I’d also like to personally thank all of the stroke survivors and carers that came to the meeting to share their experience and insight. Their willingness to openly discuss these issues, their humour and enthusiasm to contribute towards helping the community was inspirational. Hi, thanks very much for sending this out. I am very keen to get involved although ironically I am unavailable for six weeks (Australia from 9th March – 19th April). But nonetheless please keep me updated and I will catch up and help out once I get back.